Jamie Vardy says he plans to stay at Leicester for a long time after agreeing a new three-and-a-half-year deal with the Premier League leaders. The England striker, who is yet to sign the new contract, has more than two years to run on his current deal. Vardy, 29, joined Leicester from Fleetwood for £1m in 2012. 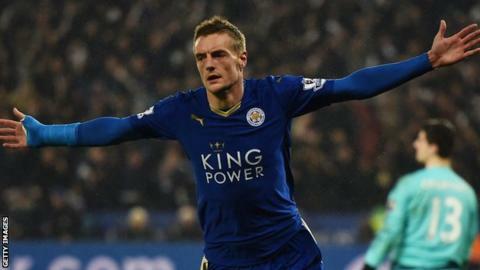 Speaking after scoring twice in the Foxes' 2-0 win over Liverpool, he said: "It's nothing people don't know. I'd like to be here for a long time." Victory kept Leicester three points clear of Manchester City, who they visit on Saturday. In November, Vardy became the first player to score in 11 successive Premier League matches. He broke the record, previously held by Ruud van Nistelrooy, when he put Leicester ahead in their 1-1 draw with Manchester United.